Archaeologists from France’s National Center for Scientific Research (CRNS) and their colleagues from the Saudi Commission for Tourism and National Heritage (SCTH) have discovered camelid sculptures “unlike any others in the region” dating back to the first centuries BC or AD, according to a press release from the CRNS. 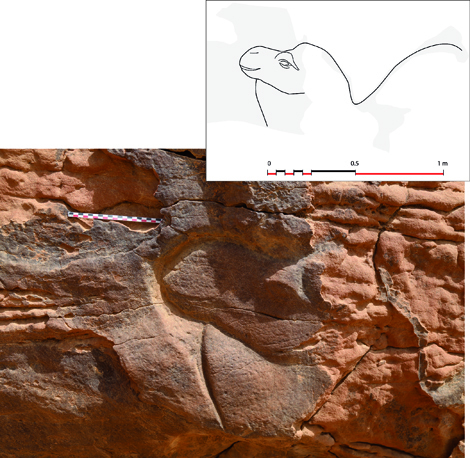 The find sheds new light on the evolution of rock art in the Arabian Peninsula, the CRNS said. The Camel Site is merely the latest in a string of archeological discoveries in Saudi Arabia in recent years. Last year, nearly 400 structures dating back thousands of years were found, with many clustered in Harrat Khaybar, a volcanic field located north of Medina in Saudi Arabia. Using Google Earth imagery, archeologist David Kennedy examined burial sites and other so-called Works of the Old Men, created by nomadic tribes thousands of years ago, according to a profile featuring his discoveries in the New York Times. In August, a team led by landscape archaeologist Paul Breeze of King’s College London used high-resolution satellite imagery, aerial imagery, and geological maps to identify 46 archaeological sites beside ancient lakes in Saudi Arabia’s western Nefud Desert, in the northern part of the Arabian Peninsula. Efforts to open up Saudi Arabia to the world as part of Saudi Arabia’s Vision 2030 include a new program to issue tourist visas for the first time, allowing foreigners access to Saudi Arabia’s heritage sites.